“Choronzonic Chaos Gods” is the last Centurian album of the original line-up that included future Severe Torture members Seth van de Loo (vocals), and Patrick Boleij (bass guitar). Despite the somewhat misleading imagery and album title, only a few of the tracks actually deal with the Thelemic Chaos Magick subject thematically. It is a rejuvenation of the classic 90s Morbid Angel and Deicide death metal sound. It was the Dutch equivalent of the South American – and Florida death metal sound in many ways. Centurian, the spiritual successor to speed/thrash metal unit Inquisitor, sounds very inspired by, and is a contemporary interpretation of, “Abominations Of Desolation” Morbid Angel, “Legion” era Deicide, and early Krisiun (“Black Force Domain” specifically). The spirit of Inquisitor, in terms of music as much as lyrics, still looms over Centurian on this record as it is far thrashier than any of its future output. This becomes especially apparent in tracks as ‘The Law Of Burning’ or ‘Let Jesus Bleed’. Centurian would abandon the last vestiges of its thrash metal past on the following album. ‘In the Name Of Chaos’ is an early example of what direction the band would take on “Liber ZarZax”. Carrying the band musically are drummer Wim Van der Valk and lead guitarist Rob Oorthuis. Rounding out the line-up are Seth van de Loo (vocals), and Patrick Boleij (bass guitar) – while both deliver exemplary performances, they were hardly what defined Centurian. Van de Loo’s vocals are an approximation of Monstrosity frontman Jason Avery, and Boleij’s bass licks are more felt than heard, a fault that would thankfully be remedied with his own more Cannibal Corpse inspired project Severe Torture. The true highlights of the songs are the frantic leads/solos of guitarist Rob Oorthuis. The lead work reflects the Morbid Angel and Krisiun influence. Unlike their Brazilian peers Centurian is dynamically richer and, on this record in particular, also far thrashier. ‘Damned and Dead’ is a re-working of ‘Outro’ that appeared on the “Of Purest Fire” demo/EP. ‘Hail Caligula!! !’ samples the impalement scene from the 1982 exploitation peplum/sword-and-sandal cheapie “Caligula, the Untold Story” by legendary Italian shlockmeister Aristide Massaccesi (popularly known internationally under his pseudonym Joe D’Amato). Only ‘In the Name Of Chaos’ deals with the band’s Chaos theme that would feature prominently on this album’s much-lauded successor. The only conceptual shortcoming is that Chaos concept is hardly explored beyond the peripheral. “Liber ZarZax” would, at least in part, rectify this mishap – but the majority of Centurian’s lyrics continue to revolve around protest of organized religion. However seeing how the Chaos theme features so prominently in the visuals one is hardpressed not to notice how few times the record actually bothers to deal with said subject. For the last time the band recorded at Q.S.A. Studio with Vincent Dijkers producing, and it isn’t hard to hear why. Dijkers’ work behind the console is adequate for what it intends to achieve but it by and large remains a glorified and much bass-heavier demo production. Despite its shortcomings the production fits the music. The guitars, rhythm as well as lead, are crunchy and vibrant, while the bass guitar is felt more than it is heard. Only the drums sounded better on the band’s 1997 “Of Purest Fire” demo. On almost all fronts the album was an improved over the demo. 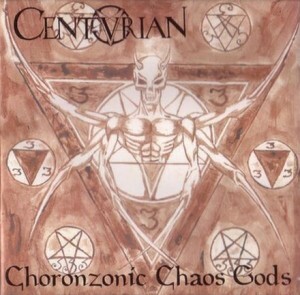 “Choronzonic Chaos Gods” was the second of three Centurian records with very similar artwork. This album’s artwork was painted in the blood of lead guitarist/co-founder Rob Oorthuis to spiritually charge the album. It is rather interesting in retrospect that regional death metal combo Zi Xul and its members are mentioned in the album’s thanklist. “Choronzonic Chaos Gods” was released on American black metal specialist label imprint Full Moon Productions in 1999, and duly re-issued in 2014 by American underground specialist label Hells Headbangers Records to capitalize on the band’s reactivation. As far as contemporary death metal goes Centurian, along with Rebaelliun, were among its better examples. What sets Centurian apart from its imitators was the underlying thrash – and speed metal foundation, and the surprisingly dynamic writing within a high-speed framework. The stellar lead playing would also rapidly become a lost art among younger bands in the genre, especially in the more brutal subset of the genre. Even with the conceptual and productional shortcomings “Choronzonic Chaos Gods” is a very accomplished and contemporary rejuvenation of the classic Florida death metal sound as pioneered by genre pillars Deicide and Morbid Angel. 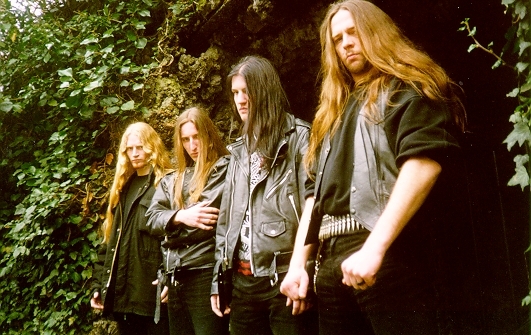 By 1997 lead guitarist Rob Oorthuis had joined Inquisitor, and his unique riffing style called for a vessel all its own. Retaining its anti-Christian sentiment the newly formed Centurian adopted the Chaos theme. Forgoing its thrash metal influences Centurian aimed for a denser and more technical death metal sound. 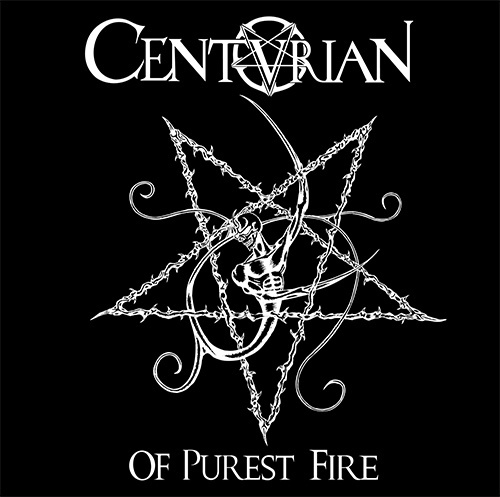 “Of Purest Fire” is the band’s first independently released demo that showcased the band’s chosen style, and included a pair of covers from its main inspiration Morbid Angel and its predecessor Inquisitor. ‘Intro: Evoking Demonstorms’ samples the invocation scene from “Hellraiser IV: Bloodline”. ‘Hell At Last’ sounds like a leaner, meaner version of “Covenant” era Morbid Angel with grunted/shrieked vocals of prime era Deicide. ‘Soultheft’ is one of the stronger cuts of the demo, and it would appear on the band’s debut album in re-recorded and vastly superior form two years later. ‘Better Off Burning’ has a couple of worthwhile riffs but it can be heard why it was discarded at a later stage. The same goes for ‘God Got Killed’. Of the tracks exclusive to this demo the title track is among the stronger ones. ‘Outro’ would be re-written as ‘Damned and Dead’ on the band’s “Choronzonic Chaos Gods” debut a mere two years down the line. The liner notes specifically hail Glen Benton, Trey Azagthoth, Pete Sandoval and (second line-up) Marduk drummer Fredrik Andersson. That isn’t to say that these cuts are any less worthwhile, but rather that it was understandable on the band’s part why they weren’t refurbished later on. It stands to reason that ‘Hell At Last’, ‘Soultheft’ and the pre-production idea for ‘Damned and Dead’ are plainly stronger than the remaining songs. As a historical document it is interesting in that it is the missing link between Inquisitor’s cult debut album “Walpurgis – Sabbath Of Lust” and the Centurian debut from 1999. An argument can be made that “Of Purest Fire” on various fronts is stronger than the following debut. None the least the demo was superior in terms of production work and overall presentation. As far as Deicide and Morbid Angel influenced death metal go Centurian was leagues better than a lot of its imitators and copycats. Not only due to the extreme speed at which they played, but more importantly thanks to the hellish drumming of Wim Van der Valk and the chaotic, mesmerizing lead playing of guitarist Rob Oorthuis. Like the preceding Inquisitor album “Of Purest Fire” was recorded as a trio at Q.S.A. Studio with Vincent Dijkers producing. Despite being a production of limited funding the demo for the most part sounds better than the album that would follow two years later. This rings especially true for the drums that sound a lot more powerful and gritty here. 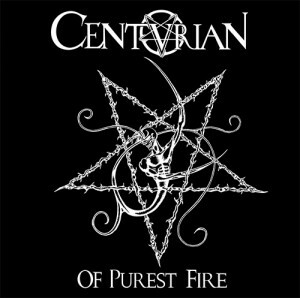 “Of Purest Fire” is the first of three Centurian records with very similar artwork. The creature in the drawing that first appears here would return in various forms over the next two albums. Some of the thrash metal architecture would be carried over on “Choronzonic Chaos Gods”. Centurian would reach its creative apex on its lauded second album “Liber Zar Zax” after which they abruptly split due to mounting interpersonal conflicts. “Of Purest Fire” was originally released independently in 1997 on cassette by the band. It was first re-released in CD format as an EP through American black metal specialist label Full Moon Productions in 1998 when Centurian signed for its debut album. It was re-issued once more most recently by American underground metal label imprint Hells Headbangers Records in 2014, to capitalize on the renewed interest in the band’s backcatalog after they had announced to return to active duty. Judging by the quality of the demo it isn’t very surprising that Centurian ended up getting contracted and eventually having its music reach audiences in Europe and North America alike. Uncompromising to the extreme “Of Purest Fire” has one of Holland’s most promising units in its formative stages, and they would only make an upward trajectory from there on forward.